with Vivitar 2X Doubler & Mamiya-Nikon adapter. Moon taken with Nikon D-90 and Mamiya 500mm (with Mamiya 2x doubler). 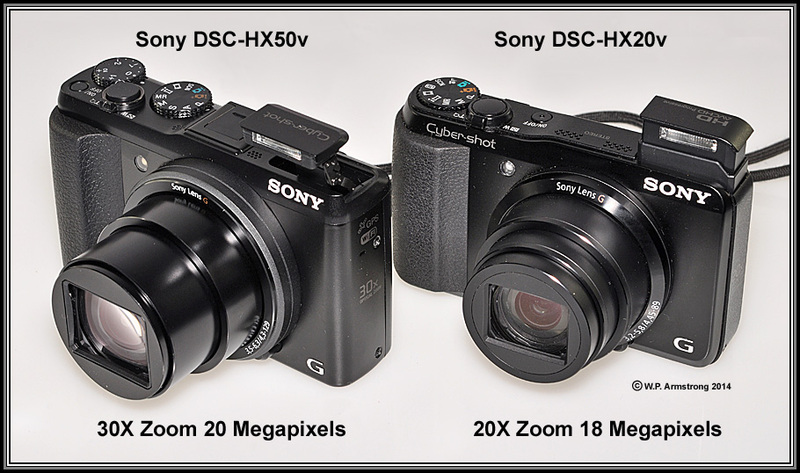 Left Image (Thursday 7 July 2011): ISO 1000, 1/80, F-8. 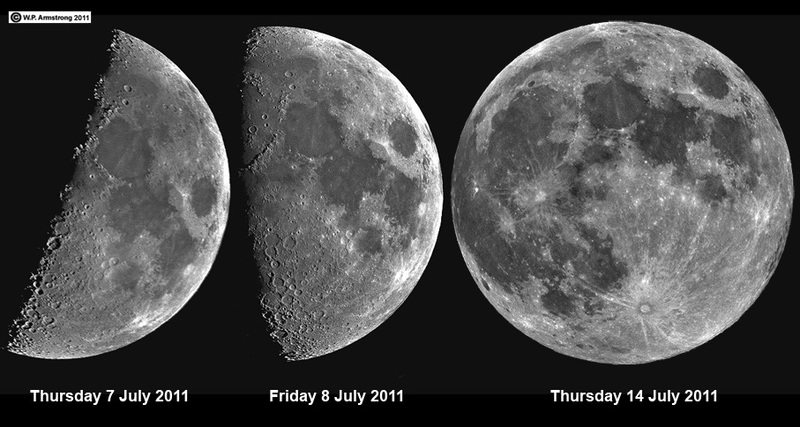 Middle Image (Friday 8 July 2011): ISO 500, 1/200, F-8. 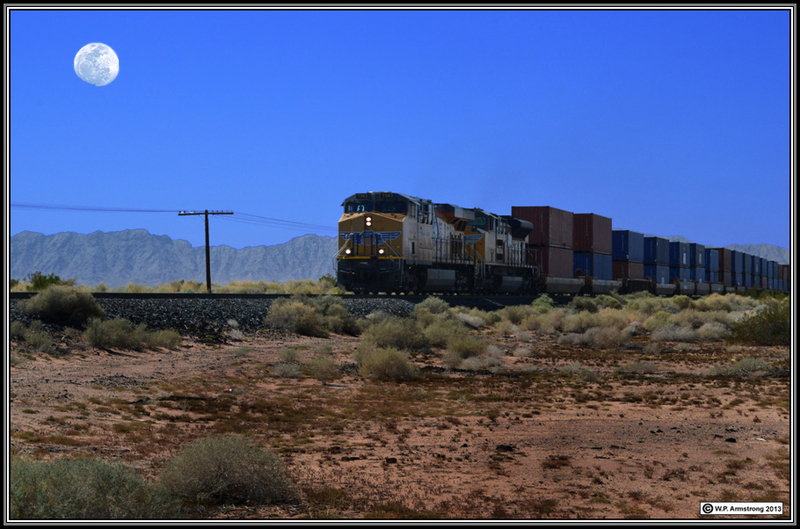 Right Image (Thursday 14 July 2011): ISO 200, 1/250, F-8. Craters show better during partial moon phases. I must confess that some of my moon images on this page were taken hand-held with a Sony HX50V set on Program Mode and Hand-Held Twilight Modes. I carry this little camera on my belt at all times! The common definition for Blue Moon referring to the second full moon in a month is incorrect. This definition comes from a March 1946 article in Sky & Telescope magazine by James Hugh Pruett. Apparently the author misinterpreted the traditional definition in the 1937 Maine Farmer's Almanac and his definition has been perpetuated for 66 years: "Seven times in 19 years there were--and still are--13 full moons a year. This gives 11 months with one full moon each and one with two. This second in a month, so I interpret, was called Blue Moon." The widespread adoption of the definition of a Blue Moon as the second full moon in a month followed its use on the popular radio program StarDate on January 31, 1980. This is a good example of a stated "fact" that has been misinterpreted. 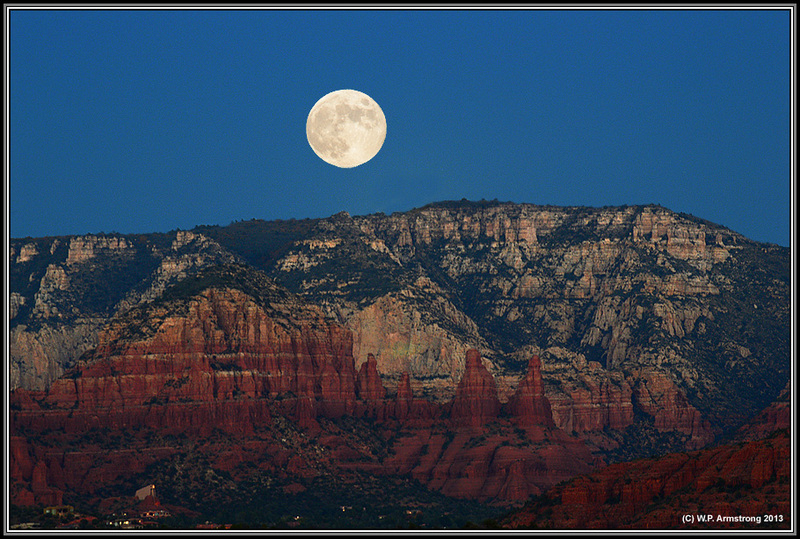 The term "Blue Moon" is the name for the third full moon in a season that has four full moons, instead of three. It is not the color blue, unless perhaps viewed through the dust cloud from a volcanic eruption. It is also used colloquially to mean a rare event, as in the phrase "once in a blue moon." In the 19th and early 20th centuries, the Maine Farmer's Almanac listed blue moon dates for farmers. 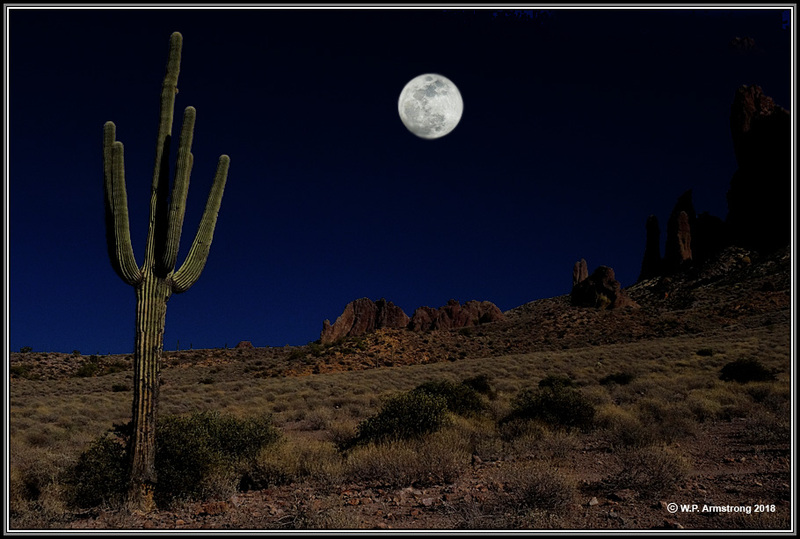 Normally each season (quarter) of the year has three full moons and these are given names, such as Hay Moon for the first moon of summer, Corn Moon for the second moon and Harvest Moon for the last moon of summer. When a season has four full moons the third is called Blue Moon so that the last can continue to be called the proper name for that season. Please refer to Wikipedia for more information and references on this subject. 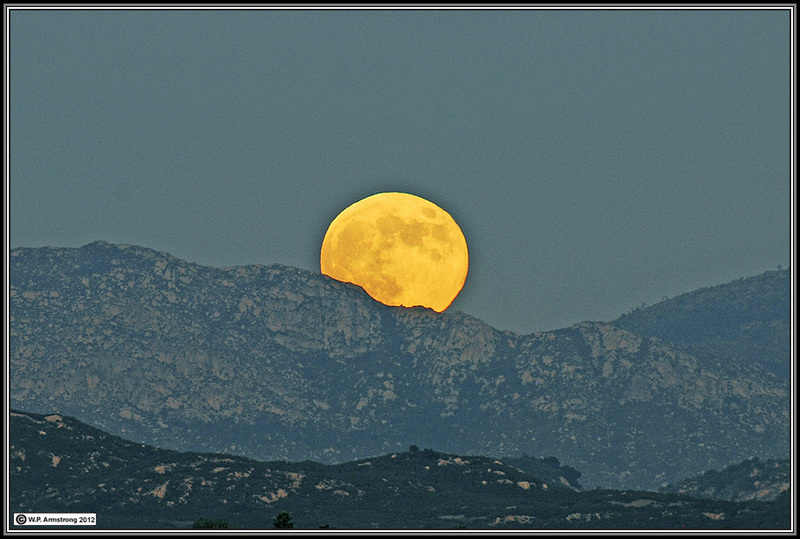 Another common definition for Blue Moon refers to the the second full moon in a month; however, this is incorrect. This definition comes from a March 1946 article in Sky & Telescope magazine by James Hugh Pruett. Apparently the author misinterpreted the traditional definition in the 1937 Maine Farmer's Almanac and his definition has been perpetuated for 66 years: "Seven times in 19 years there were--and still are--13 full moons a year. This gives 11 months with one full moon each and one with two. This second in a month, so I interpret, was called Blue Moon." The widespread adoption of the definition of a Blue Moon as the second full moon in a month followed its use on the popular radio program StarDate on January 31, 1980. This is a good example of a stated "fact" that has been misinterpreted. 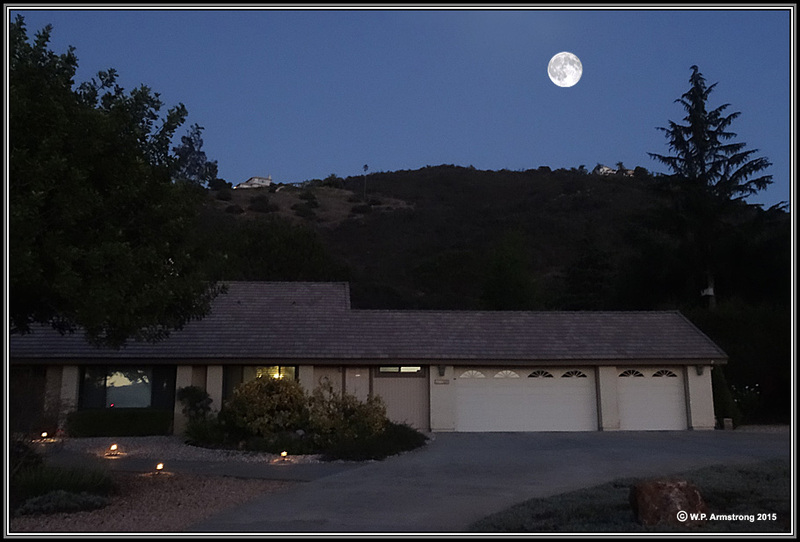 Harvest Moon rising above the hill behind my house in Twin Oaks Valley. 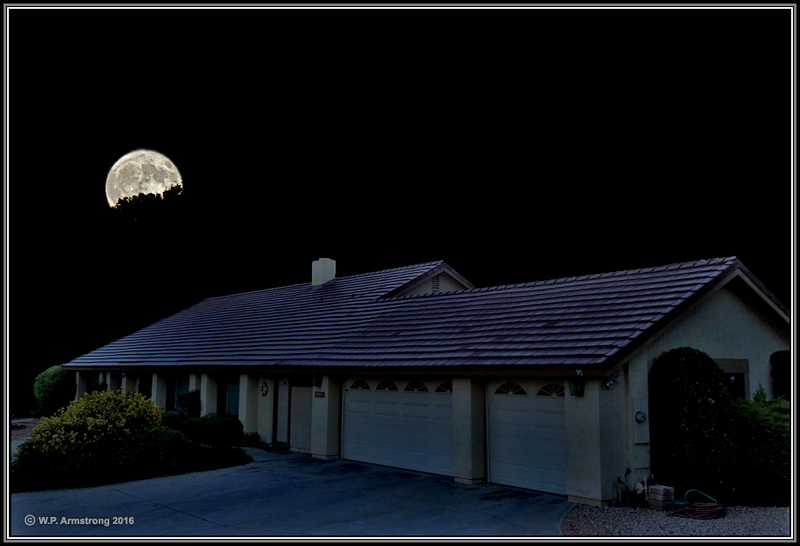 I used two different exposures for house and moon. 16 September 2016.
from the moon passing through a greater amount of atmospheric particles than when the moon is overhead. 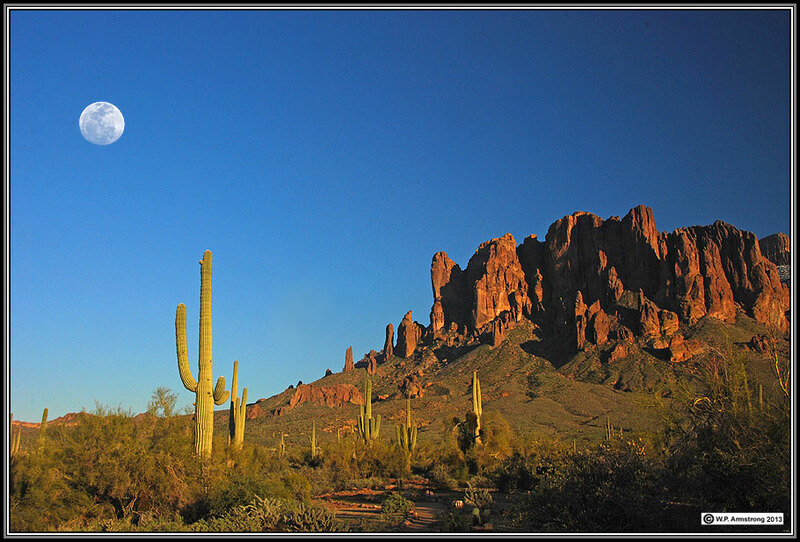 Click On Image To Return To White Mtns Home Page. 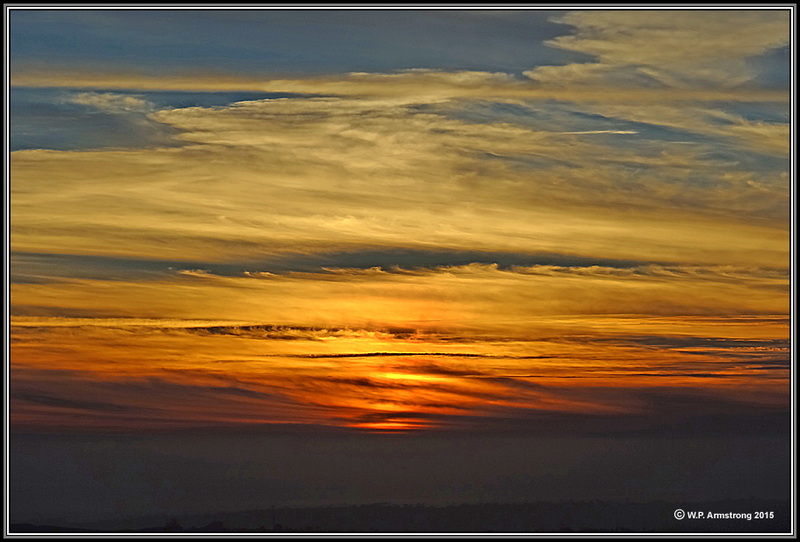 Sunset over ocean from Owens Peak (27 September 2015): Night of the Super Moon. Standing on Owens Peak last night at 8:00 PM: 24 hours after total eclipse & blood moon. It was necessary to take two different exposures for this image. 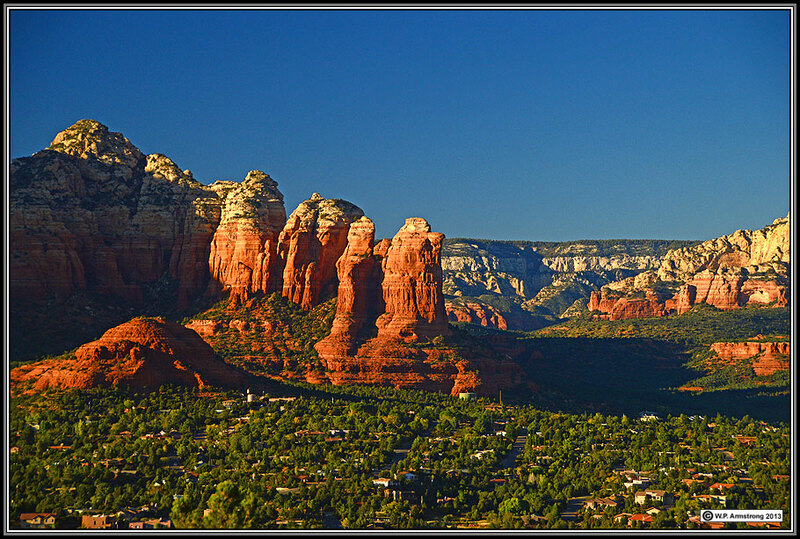 The sandstone formation was taken at ISO 200, f 8, 1/6 sec. The moon was taken at ISO 200, f 8, 1/100 sec. 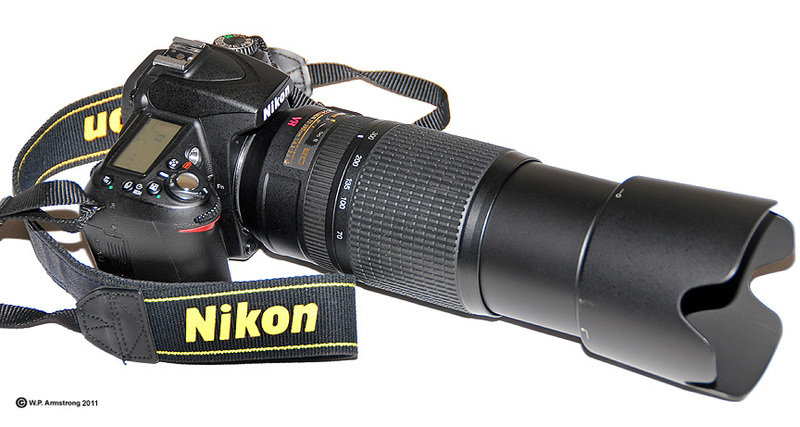 Camera: Nikon D-3200 with 70-300 mm lens on tripod. 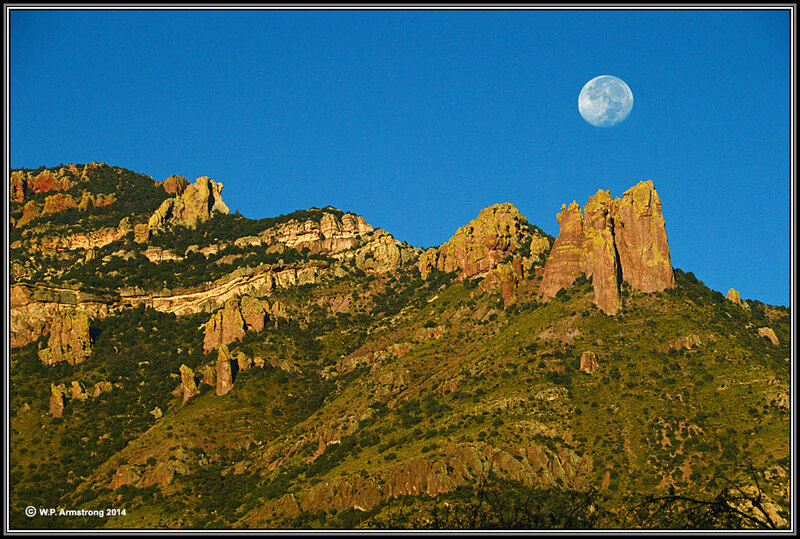 Tripod was placed on hillside east of Sedona: 18 October 2013 6:00 P.M.
© W.P. Armstrong 29 October 2012 6:30 P.M. 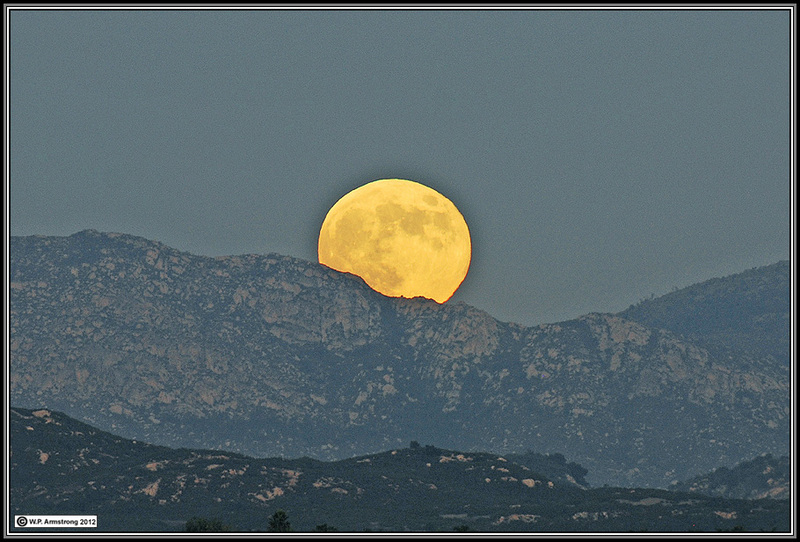 Images of Hunter's moon from the summit of Owens Peak northeast of Palomar College. 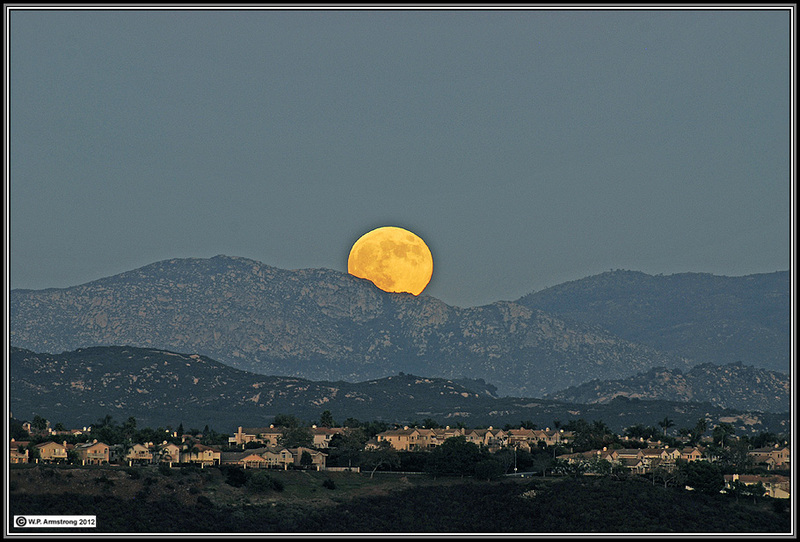 The moon is rising over Emerald Heights, Escondido with the rugged granitic hills of Dailey Ranch in the distance. 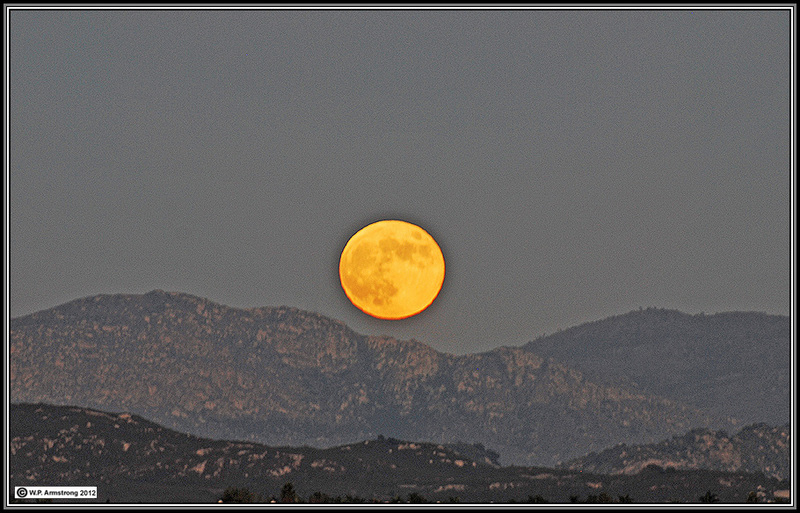 This beautiful moon appeared in the horizon a few minutes after sunset on 29 October 2012 at approximately 6:30 P.M. There was a little atmospheric distortion of the moon which I did not correct. The warm (reddish) glow of the moon shortly after it rises is caused by light from the moon passing through a greater amount of atmospheric particles than when the moon is overhead. 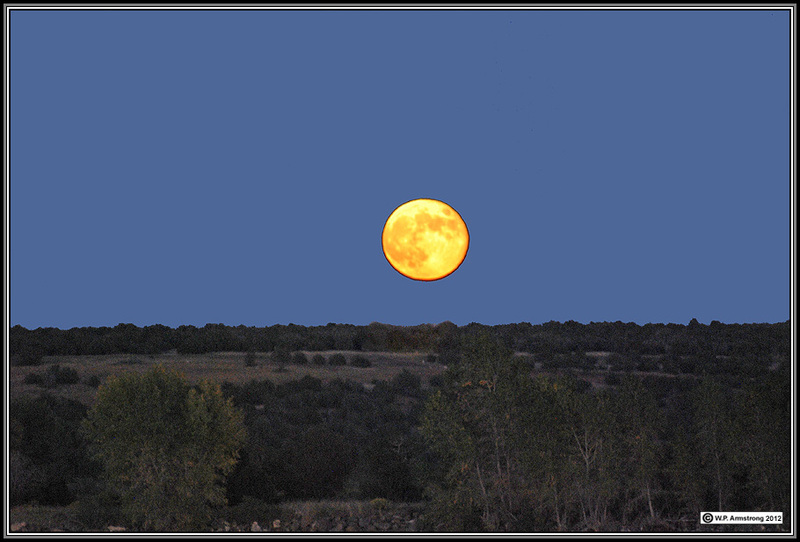 Hunter's moon is the first full moon after the Harvest Moon. 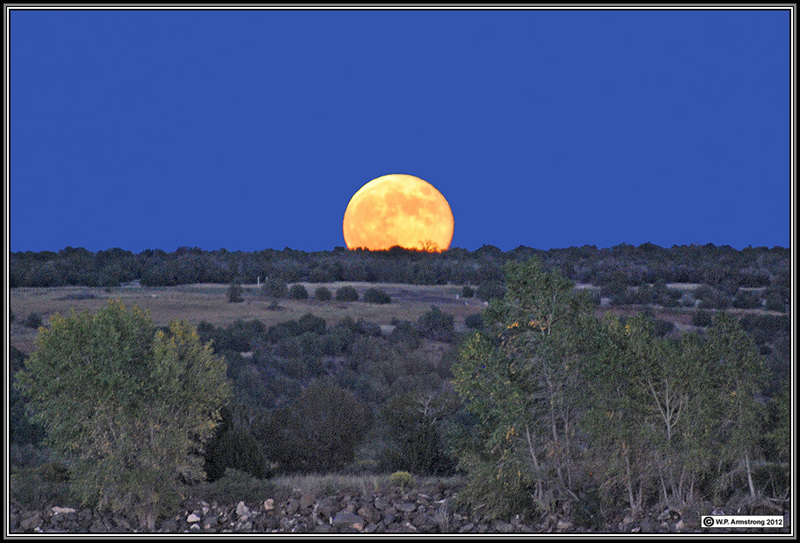 The Harvest Moon is the full moon nearest the autumnal equinox (September 22). Hunter's moon is supposedly named because plenty of moonlight is ideal for hunters shooting migrating birds in northern Europe. According to Wikipedia, the name may also have been used by Native Americans as they tracked and killed their prey by autumn moonlight, stockpiling food for the coming winter months. 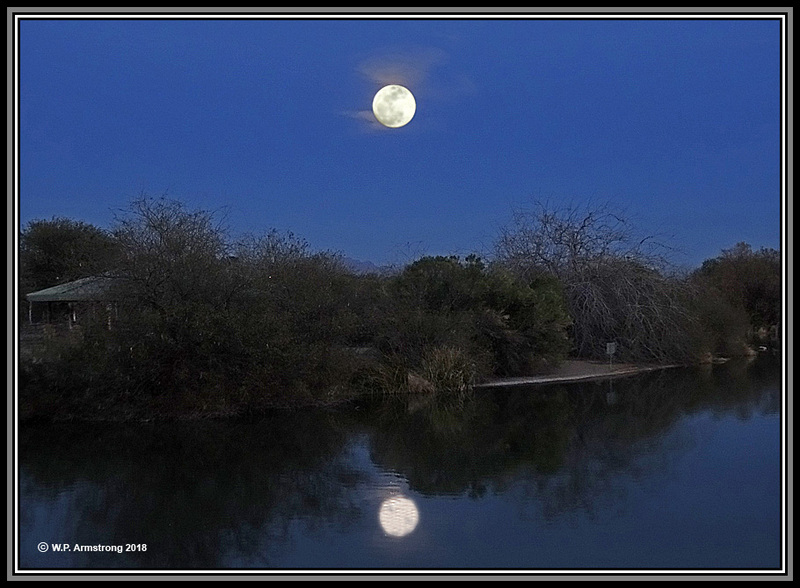 Two images of Hunter's Moon using slightly different exposure settings with Photoshop. The best images were taken with moon nearest the horizon. At this level the moon appears larger and more reddish. 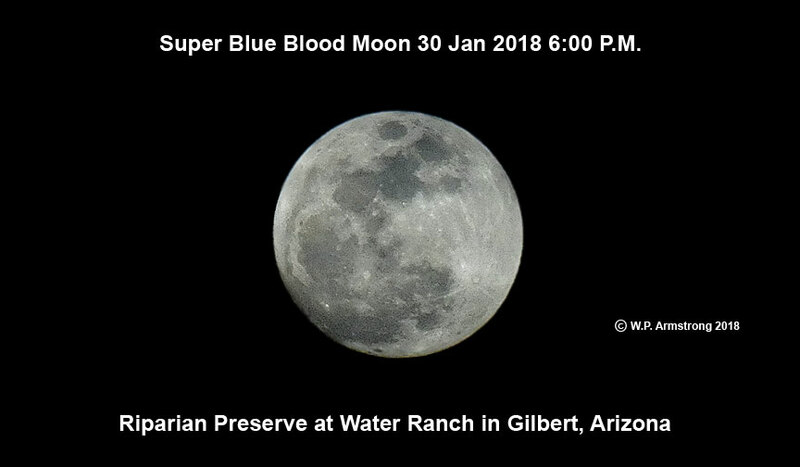 Super Blue Moon Over The Superstions 31 January 2018. 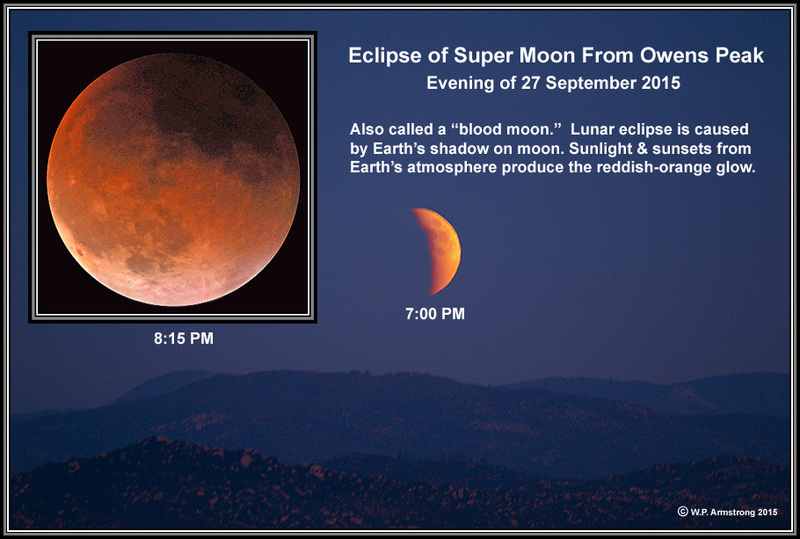 Why is it called a Super Blue Blood Moon? 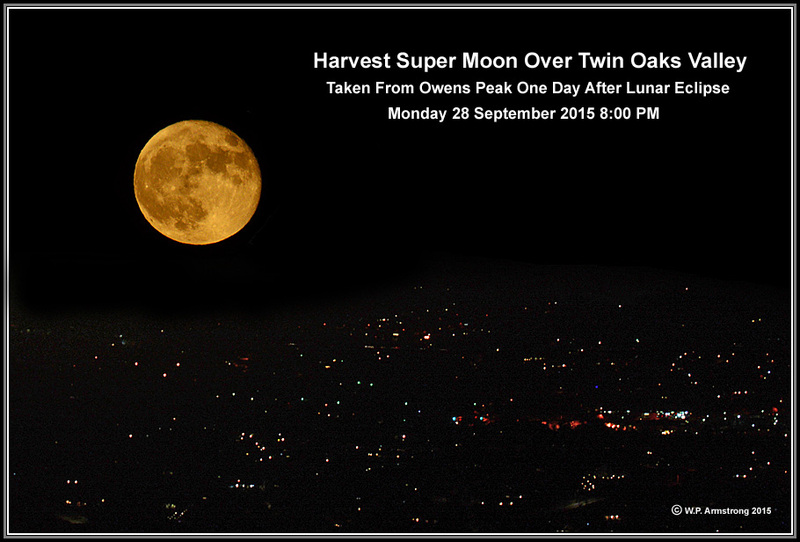 Supermoon: When the Moon is at or near its closest point to Earth. Blue Moon: The second full moon in a month. 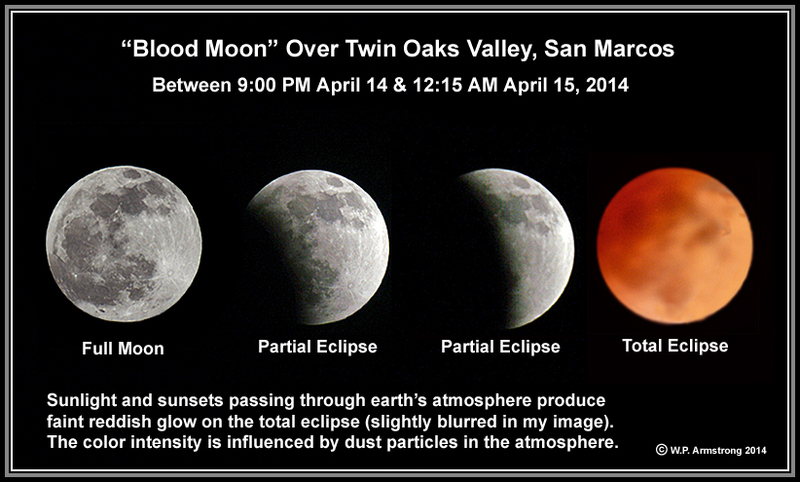 Blood Moon: The red tint Earth's shadow casts on the Moon during a lunar eclipse. 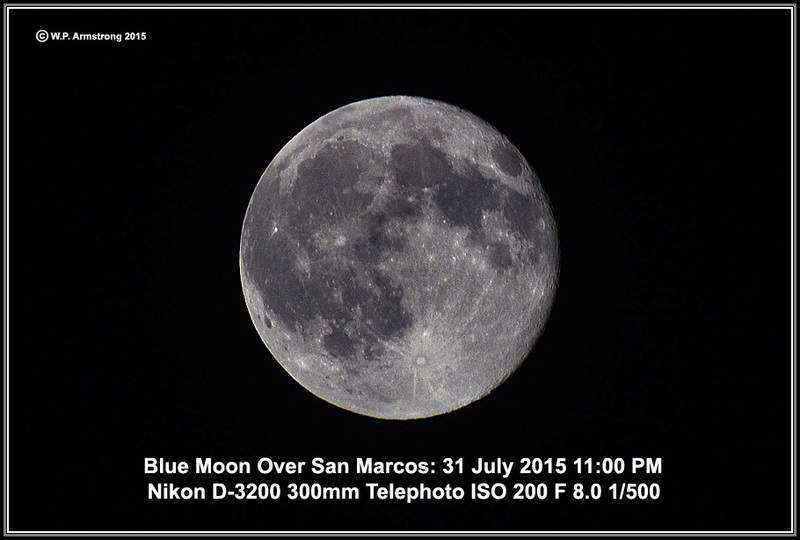 See More Detailed Explanation For Blue Moon On This Page.